Translated by Daniel Brown, Ph.D.
Let me pour this view into your mind, my friends. 2. 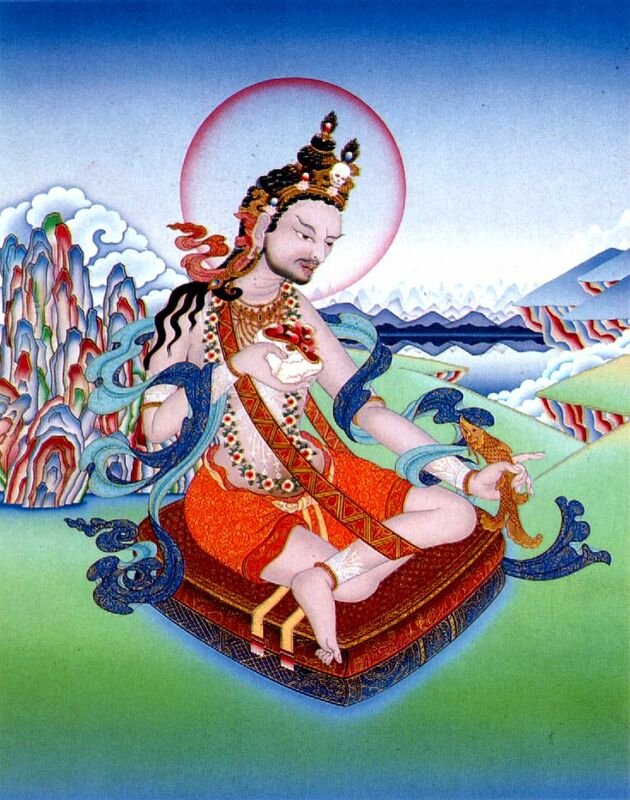 Although Mahamudra isn’t anything I can really explain. 3. Cling to nothing as I speak, and there is no doubt, liberation will come. Because from this vantage point, awareness sees itself by itself. You will attain perfect awakening. But don’t go anywhere, or stay anywhere. Thought is like waves that become calm. 5. Just as space has no color. It has no form. It has no darkness. No light. It is changeless. Nor the light of virtuous actions. Has never been clouded by darkness. Has never been clouded by the cycle of Samsara. But you can’t really explain it in words. This mind is…insubstantial, and words won’t make awakening happen. Like vast space that saturates everything! As the teaching beyond all practices. Like the hollow inside of a bamboo stalk. Is beyond any intended meditation ob­ject. So let go of any artificial strategies of meditating. Or, by practicing ethical precepts. Just makes to stray from this truth. Moving away or moving toward anything..
And so the mind remains like a still pool of water. And don’t try to repre­sent it. And nothing will obscure the flames [of awakening!]. Then you will see everything there is to see! And you will become liberated from the prison of Samsara. All the bad karma and obscurations. Toss about in the sea of Samsara. In negative states of misery and sorrow. Need only depend on the teacher’s pointing out instructions. Is only the cause of suffering, not the cause of Truth. Other than taking the vantage point of what is the essence of Truth. The King of Meditation is: Holding this vantage point uninterruptedly. The King of Practice is: Do nothing. Do not search for anything. And your realization will directly come to fruition. There is no path to walk…. and you are already facing Buddha-mind as your mind. And it is perfect, now you awaken! 18. So my friends, please understand me well. And as such, mirages and dreams are not the Truth. Break connection with [ordinary] sensory experience. It only generates more desire and aversion. Dwell in the forests or mountains and meditate. Wither and wilt when its roots are cut. And the leaves and branches of Sam­sara end. That has accumulated for thousands of eons. That have accumulated for eons. Or you won’t see the Truth that is beyond all conceptualization. Or you won’t see the Truth that is beyond all doing. And all artificial meditation strategies. And hold the vantage point freshly. Come forth in its own right [self-con­tentedly]. Nor prevent anything from happening. And you are freed from Samsara. All that obscures, even the subtlest propensities cease. Self-illuminates the storehouse of all potential experience. 25. Complete liberation from all extreme [views]. This is the Supreme View. Wide and deep and limitless. This is the Supreme Medita­tion. Beyond any intention or cutting anything off. This is the Supreme Practice. This is the Supreme Fruition. 26. At first awakening the mind is like a fast-moving waterfall. Awakened Wisdom arises, its radiance, its emptiness. Then saturate your entire be­ing. 29. You will seem ageless and healthy like the waxing moon. And special powers of a Buddha will flourish. On the essence of Mahamudra-awakening. And in the hearts of all sentient beings! Most basic space-time = presence of every potential = singularity, unknown Current space-time = presence of every actuality plus remaining potential Final space-time = anti-singularity = infinitely dispersed space-time, end of space-time, no potential, unknown. One cannot know the potential ahead of time. The idea of potential is basically as assumption that since I see it, it must have been there prior to this point as a potential. This is basically a “working backwards from present time”. But it is something that exists in present time as an assumption. The real nature of the mind is awareness. The physical perceptions serve the mind. It doesn’t matter what you call the ground state. Just let all disturbance cease. Before and after and undercutting the disturbance is the ground state. Is the Higgs Field there if it isn’t disturbed? No space-time = no location or duration, hence no motion, no travel. Per the principle of “neti, neti” the Higgs Field wouldn’t be there in the Ground State. Ok, Thanks for telling me that. I wasn’t sure how far you wanted to reduce the ground state. As I’ve said before and per Neti Neti, when you look close enough, there will be roughness in that flattened groundstate. Ground state is not determined by me. In fact it cannot be determined by anybody because it is unknowable.
. . . and yet, there we are writing about it. I’m going to have to respectfully shy away from the conjecture of nothing and rather call this notion of nothing (ground state) “relatively nothing” only. I just an not seeing the consistency to invoke this toe of zero. Or else enlighten me how this is useful. How does the idea of no thing move our research? I interpret ‘neti,neti’ differently. It means to me that anything that you can be aware of is not the ground state. The ground state is beyond awareness. It simply cannot be speculated or extrapolated in anyaway because of ‘neti, neti’. I have no idea why you write that you interpret neti neti differently than I do. I totally agree with what you just wrote. And yet, there we are arguing about what we cannot be aware of. Arguing about our conjectures about something which by definition is not something seems fruitless, doesn’t it? It reminds me of a Hindi song in which two lovers are alone on an outing in a rowboat. Each loves the other very much and wants to spend rest of the life together. But neither knows about the feelings of the other. Neither of them wants to broach the subject for fear of rejection. So do not bring up their feelings. But during their innocent conversation they both realize how much they love each other. They end up not broaching the subject but their anxiety has disappeared. One comes down gradually from higher to lower disturbance levels. I think awareness goes up and down in terms of its highest disturbance level, just like one’s blood pressure goes up and down. Meditation gradually brings down a person’s disturbance level to a more optimum level during the operating state. During the non-operating state the disturbance level may go way down much closer to the ground state. If the average disturbance level really gets low most of the time, then it may even slow down the aging process. Samsara is awareness on this side of the curtain. Mahamudra lies in non-awareness on the other side of the curtain. Let go of conceptualization. Let go of awareness altogether and there will be awakening on the other side of the curtain. The dichotomy of awareness and non-awareness is there in the mind. Mahamudra is the non-awareness part of the mind, which is rarely explored. Here we come across the real nature of the mind. Here is the base above which everything else made of awareness floats.This base cannot be expressed ever. It is just a vantage point of awareness.